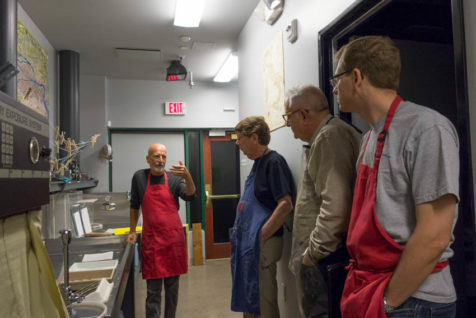 In October we hosted a Carbon Printing workshop led by Dennis L. Collins. 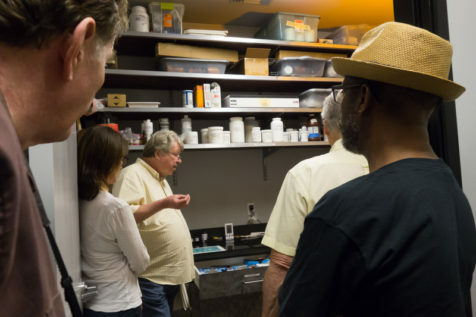 Dennis was able to lead our participants through this tricky process from start to finish – sensitizing carbon tissues with potassium dichromate, exposing the tissue with a negative, transferring the exposed tissue to the support sheet, and developing the print. 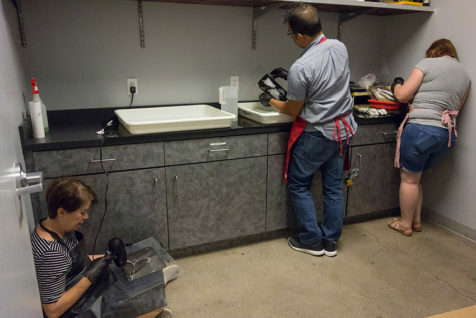 Our students got hands-on experience making prints, as well as lots of practice trouble-shooting, which will better prepare them for continuing this process on their own. 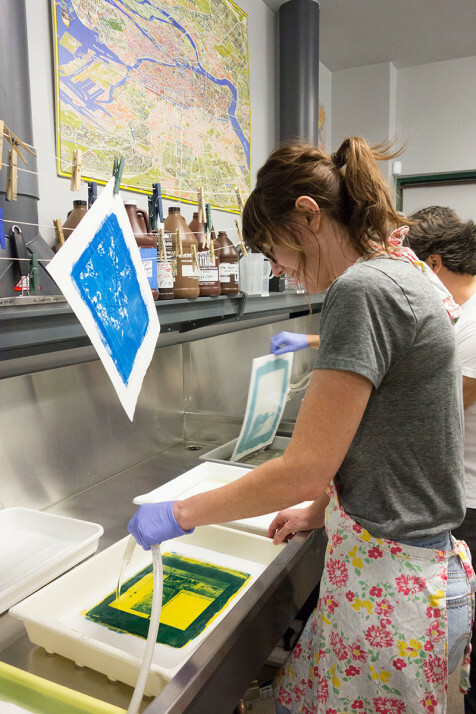 Each student made beautiful prints, and all learned to find the beauty in mistakes! 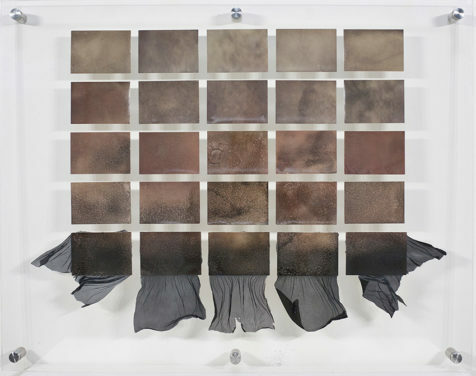 As the carbon print “develops,” un-hardened carbon pigment floats away – leaving the image remaining! We got experimental in the lab this weekend during our Mordançage workshop with Jace Becker! 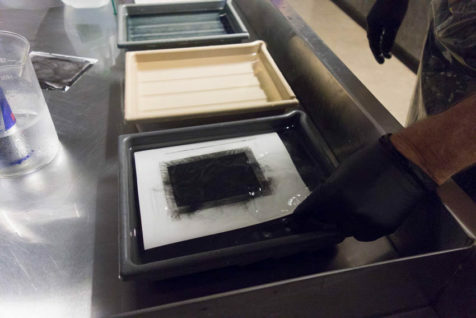 This free-form, intuitive process process physically lifts the darkest parts of a silver gelatin emulsion, forming delicate veils. 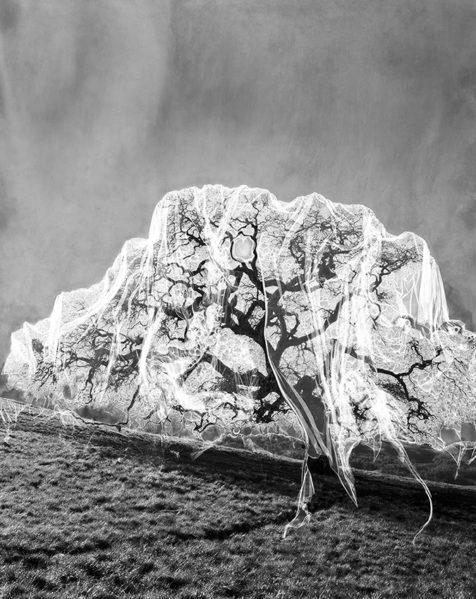 The veils can be manipulated or removed, allowing for endless creative opportunities. 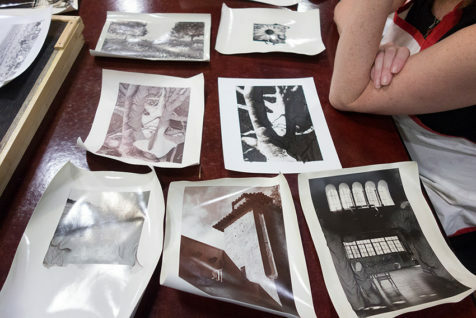 Our participants played around with a variety of techniques, achieving one-of-a-kind results with each print. 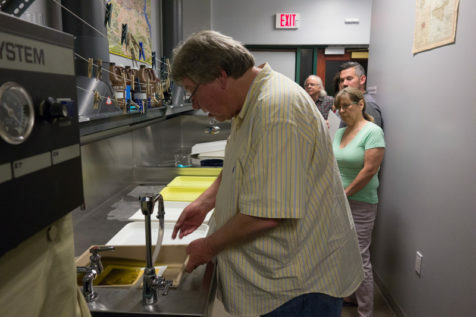 Jace demonstrated processing silver gelatin prints in mordançage solution, water rinsing baths, and developer. 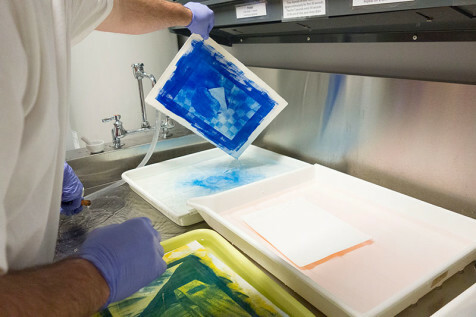 The mordançage chemistry bleaches the prints as it’s lifting the emulsion, requiring the print to be re-developed to bring back the image. 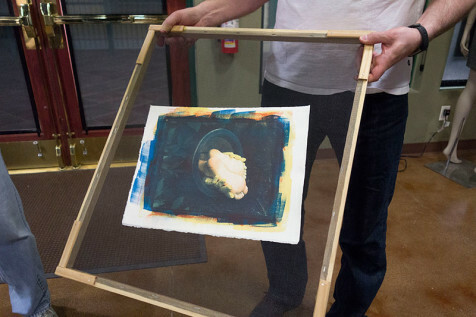 After the print has been washed, the lifted gelatin emulsion can be manipulated to add visual interest, motion, or abstract shapes to the image. We used cotton balls, hypodermic needles filled with water, compressed air, and hairdryers to place the veils exactly where we wanted them to go. 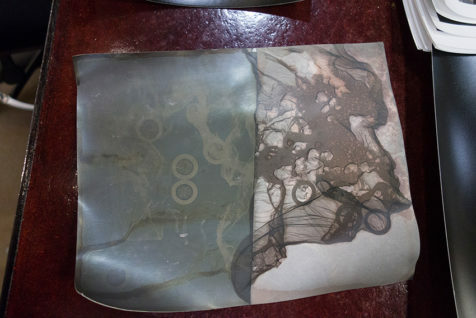 This print is slowly being re-developed – the tan parts of the print were originally black! 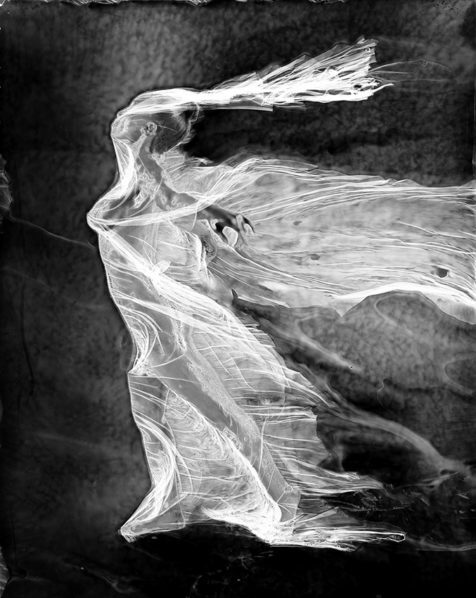 Cesar Laure had some interesting results with this half-mordançaged photogram – the altered portion of the print is on the right. 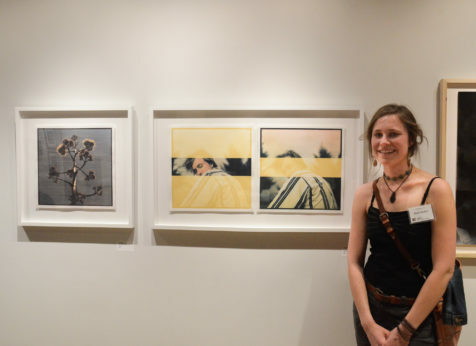 Prints by Suzanne Fallender displaying a range of different colors achieved by placing developing prints out in the sunlight. 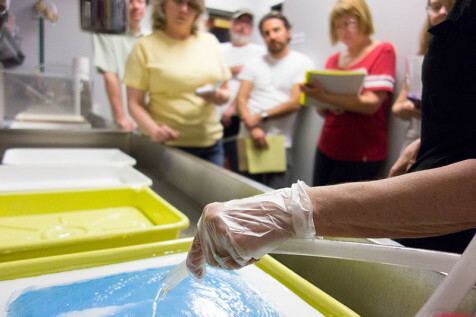 We can’t wait to see what our students make with this process! 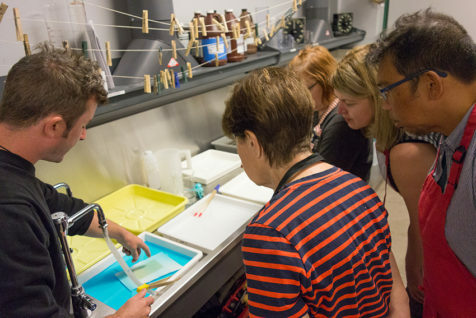 This course provides a hands-on introduction to the fascinating 19th century bleach/etch process of Mordançage. 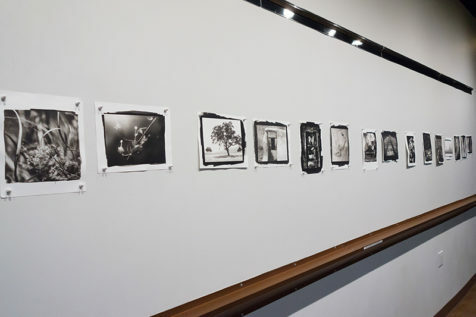 Each student will be instructed concerning the history, process, and various techniques in which to produce engaging imagery within the medium. Mordançage produces wonderfully evocative imagery, and the possibilities for experimentation are nearly endless. 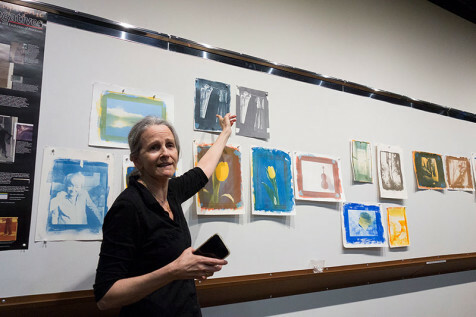 The knowledge and skills acquired in this class will equip you in the development of self-expression and provide an opportunity for intuitive applications in your own artistic practice. 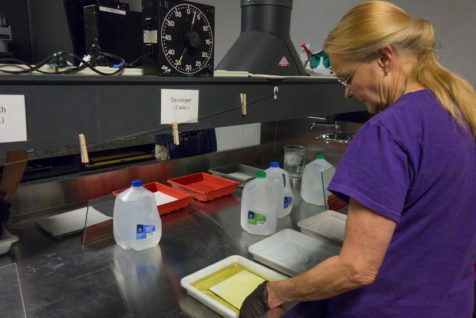 All students must be prepared to experiment, be creative, but most importantly to have fun! 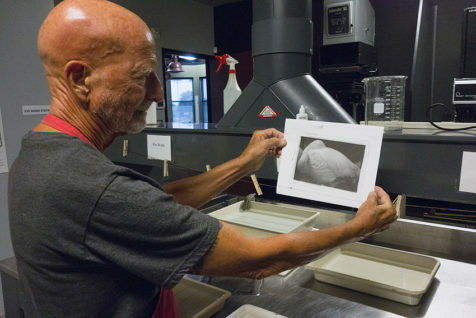 The course is intended for intermediate to advanced photographers only, as each student must possess a foundation in the fundamentals of gelatin silver darkroom printing techniques prior to enrollment. 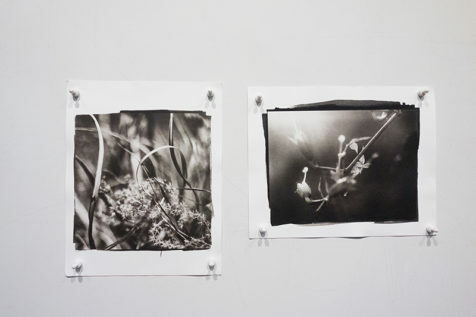 If you are new to darkroom printing or would like a refresher course, check out our 1-on-1 Tutorials. 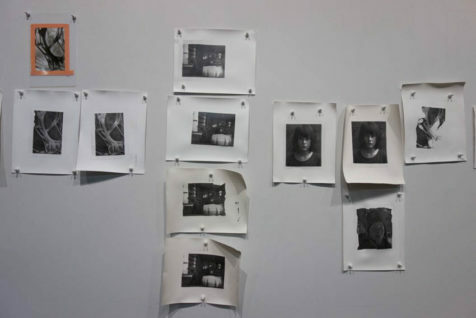 Though there will be time to make new prints during the workshop, students will benefit from bringing at least 20 finished gelatin silver prints and a large range of negatives to experiment with this process. More details will be provided upon registration. 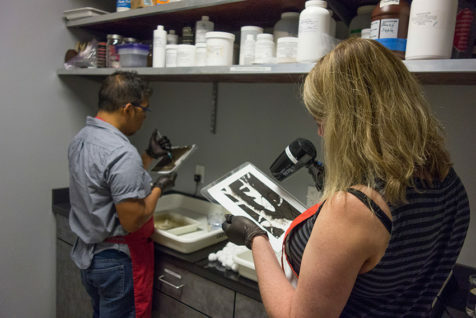 Mordançage is a mystifyingly beautiful method of altering gelatin silver prints or negatives with endless opportunities for experimentation and creative application. 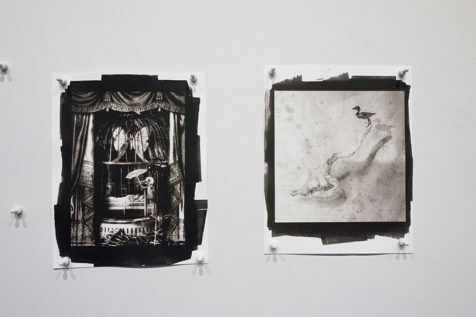 Mordançage chemistry physically lifts the darkest parts of the photographic emulsion from the rest of the image, allowing it to be manipulated into veils or removed completely. 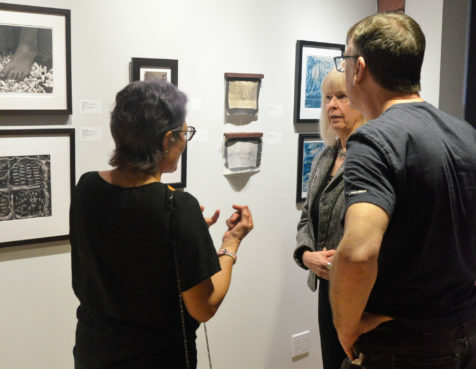 This rare 19th century process was largely forgotten, but fortunately was revived by 20th and 21st century practitioners Jean-Pierre Sudre and Elizabeth Opalenik. 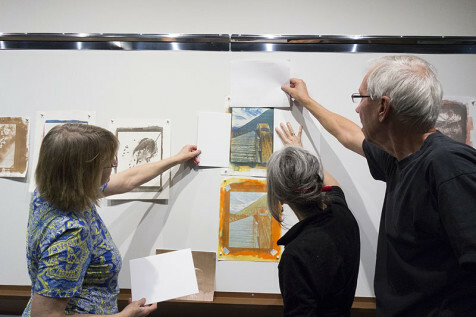 Try it yourself and prepare to be amazed at the possibilities this process will introduce to your artistic practice! 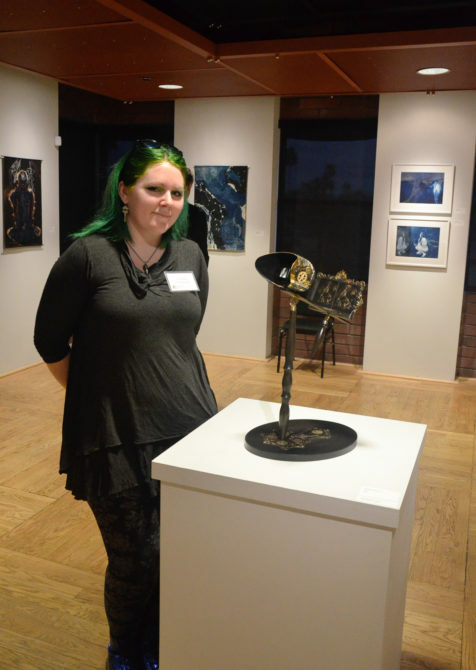 Jace Becker earned degrees in photography and anthropology from Montana State University, and is currently a 3rd year MFA candidate in Photography at Arizona State. 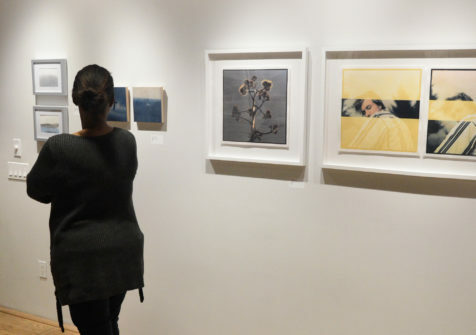 His work focuses on the cultural landscape, specifically social and self-exploration, issues of identity, vulnerability, and the darker sides of introspection. 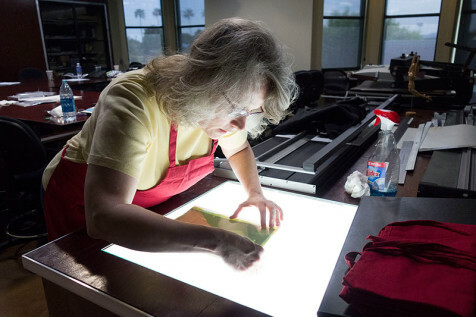 His area of emphasis is in alternative processes. 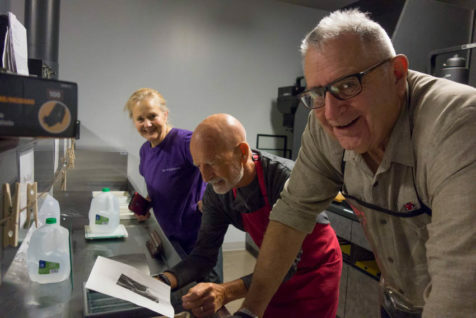 When he is not hiding from the Arizona sun in his darkroom, he is an avid rock climber, surfer, and lover of sailing. 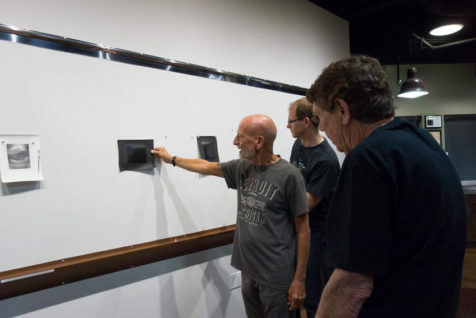 Join us Friday, September 29 for an Artist Lecture with Phoenix-based artist Jace Becker! 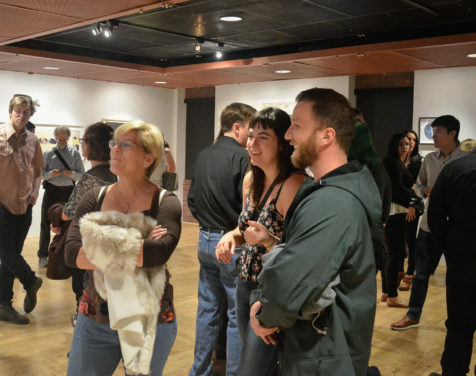 Jace will speak about his growth as an artist and how his artistic journey led him to the process of Mordançage, as well as the history of the process and others who have contributed to its evolution. This lecture is free and open to the public. To try Mordançage for yourself, sign up for our Mordançage Workshop with Jace Becker on Saturday, October 7 and Sunday, October 8! Click here for more details and to register. 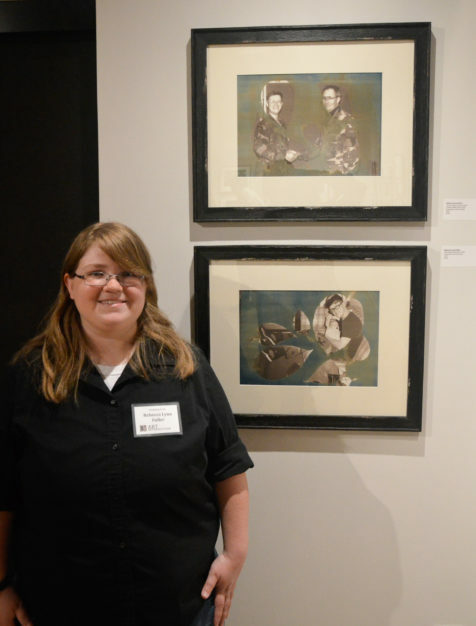 Jace earned degrees in photography and anthropology from Montana State University, and is currently a 3rd year MFA candidate in Photography at Arizona State. 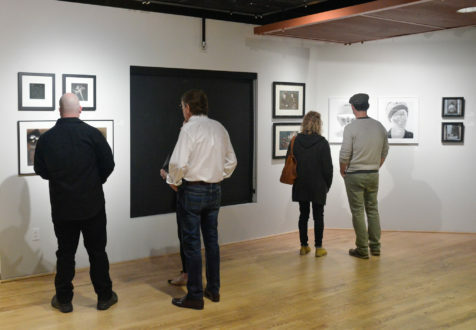 His work focuses on the cultural landscape, specifically social and self-exploration, issues of identity, vulnerability, and the darker sides of introspection. 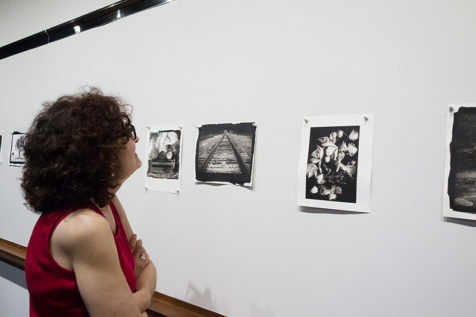 His area of emphasis is in alternative processes. 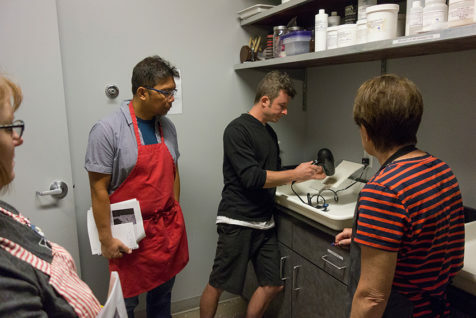 When he is not hiding from the Arizona sun in his darkroom, he is an avid rock climber, surfer, and lover of sailing. 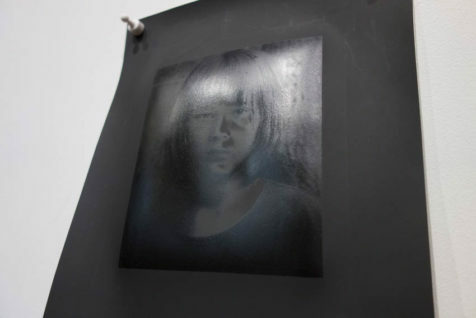 Printing out Paper, or PoP, makes an image by exposing a negative and paper to light without any chemical development. With a printing-out process, you can watch your image come to life during your exposure, rather than having to wait until it is processed! 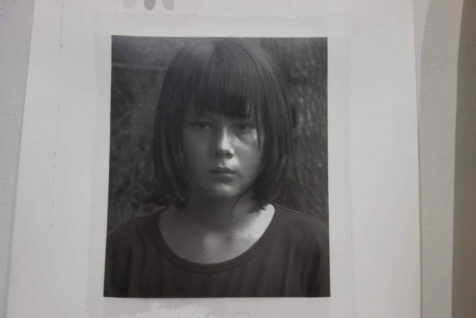 Used originally as a simplified field process without the need of a darkroom, today we use this handmade emulsion to create artful images with subtle and warm tonality. 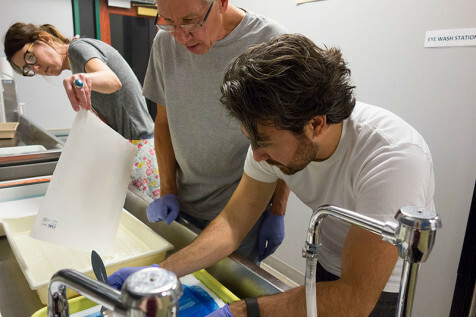 This workshop begins on Friday night with a lecture and demo, where instructor Siegfried Rempel will discuss the history of collodio-chloride printing and demonstrate two different printing-out methods. 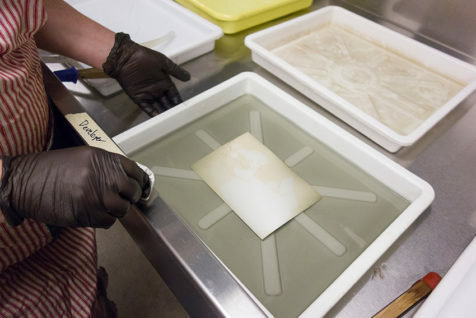 Following on Saturday is a day of coating and printing your own hand fabricated, collodio-chloride printing out paper. 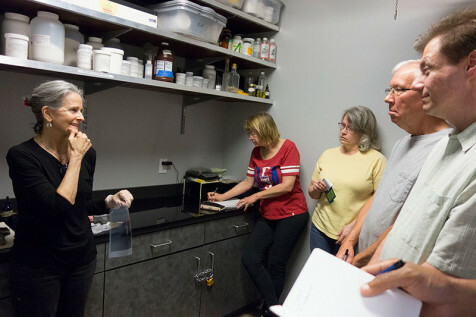 The day after the workshop, return to the lab to further refine your mastery of this process! 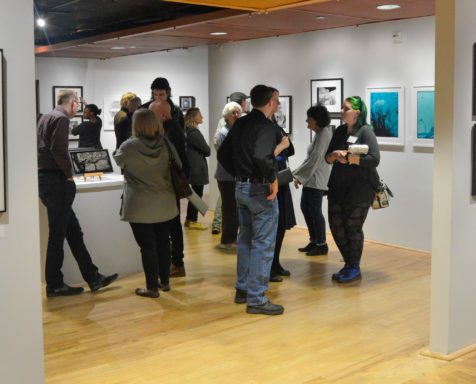 We are hosting a PoP Open Studio on Sunday, March 26 from 9am – 3pm. More information here. 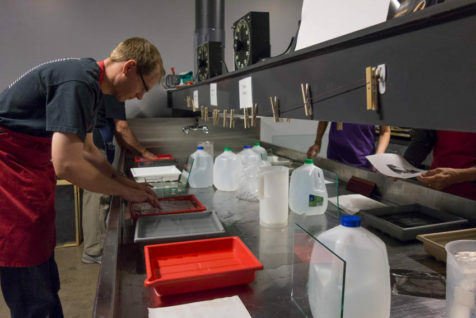 The use of Collodion in photography for the production of photographic prints an be found as early as the 1850s, and is most commonly used in the Wet Plate Collodion process to produce tintypes and ambrotypes. 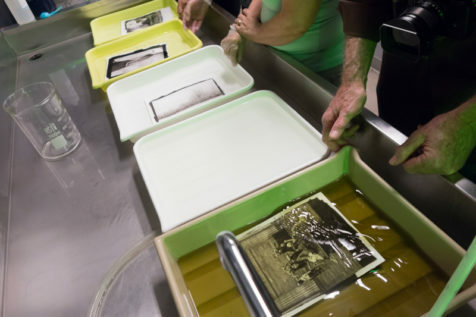 The concept of an “emulsion” of silver salts in a collodion binder was introduced by Gaudin in 1853 and by 1861 he was actively producing the “Photogene” collodion emulsion. 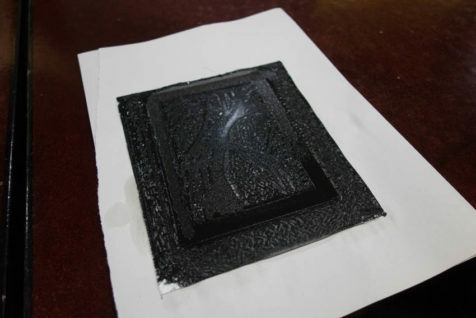 The collodio-chloride print has a similar physical appearance to its gelatin counterparts and it can be difficult to tell them apart. 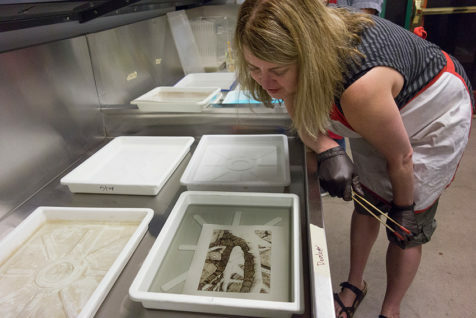 In fact, modern gelatin silver darkroom papers evolved from this early printing method! 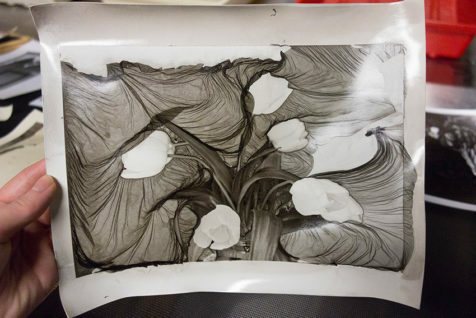 Today, we still practice the collodio-chloride process because of the rich and beautiful tonality it imparts on our images. 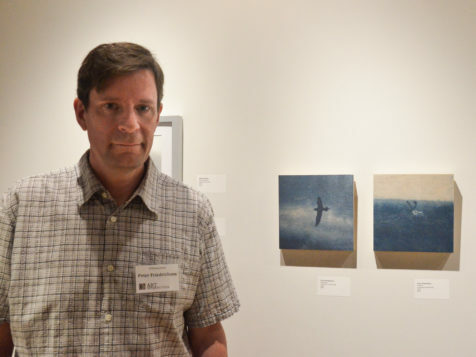 Printing out Paper expert Siegfried Rempel will give a lecture on this fascinating process on Friday, March 24. Join us for this special opportunity to learn more about this historic method – the lecture is free and open to the public. 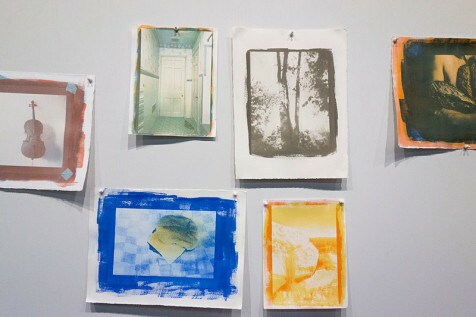 If you’re feeling inspired, join us for our Printing out Paper Workshop the following day! Learn more and register here. 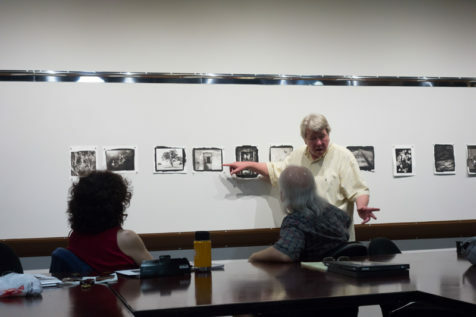 Late last month we had the pleasure of hosting a Platinum/Palladium workshop in our Photographic Arts Lab led by San Francisco-based artist Michael T. Puff! 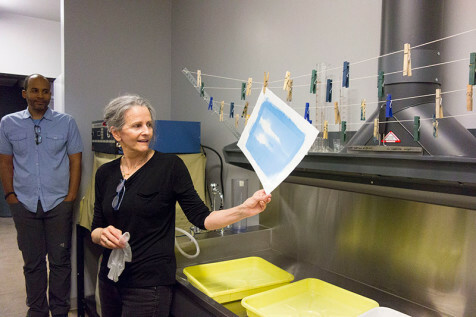 A master of this luminous, tonally-rich process, Michael led our eleven participants in making gorgeous prints of their own images. 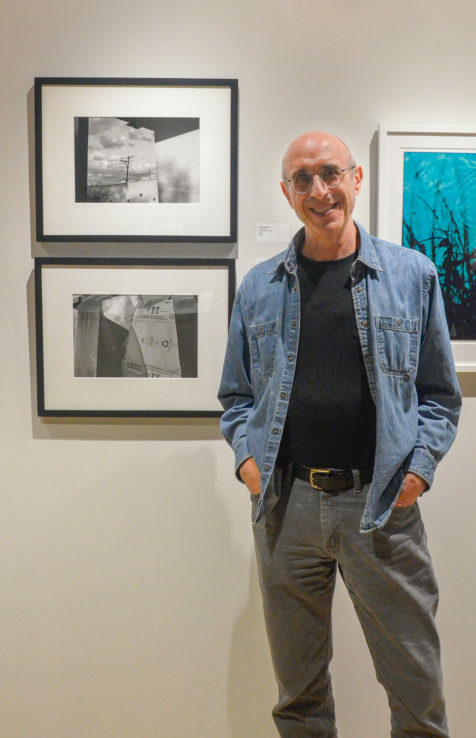 Platinum/Palladium printing, a photographic process invented in the 19th century, has long been a favorite of alternative process photographers for its highly archival nature and infinite variations of gray tones as highlights shift to shadows. 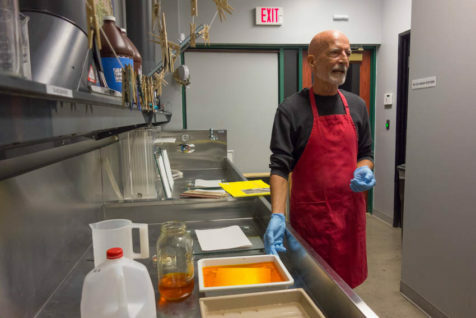 In the process Michael uses, ferric oxalate, palladium, and sodium chloroplatinate are mixed together, hand-brushed onto 100% cotton rag paper, exposed to UV light through a digital negative, and then processed with potassium oxalate and sodium thiosulfate. 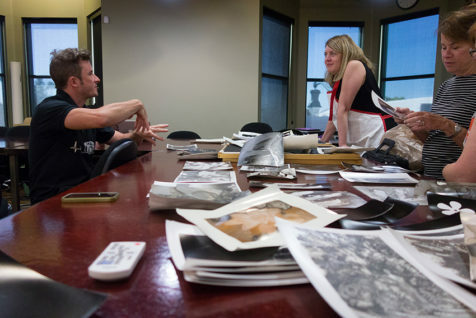 The end result is a handcrafted print that is estimated to retain its appearance for a thousand years! 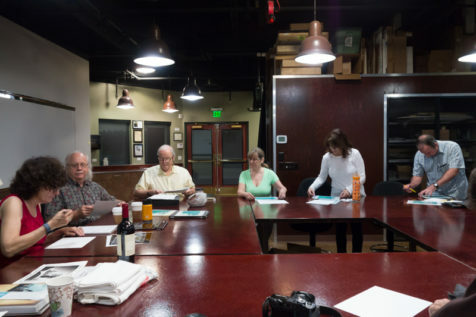 Thank you to all of our wonderful participants, and of course to Michael for traveling to us to share his expertise! 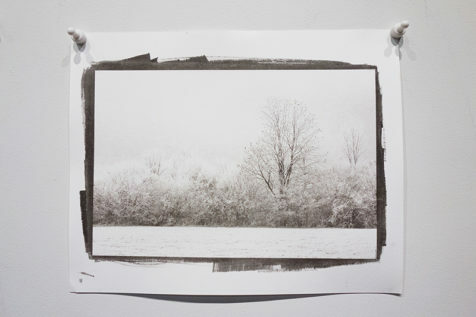 A delicate, icy print by our very own Business Manager, Debra Wilson! 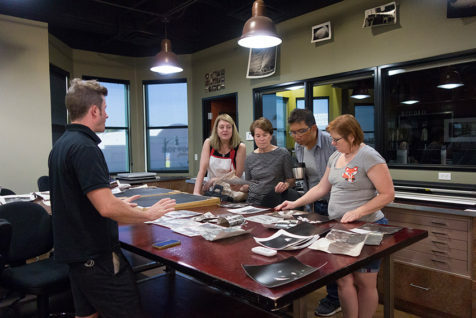 Our first Tri-Color Gum Bichromate workshop with Diana Bloomfield last September was such a hit, we decided to do it all again! 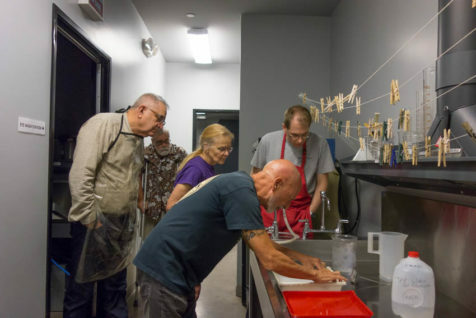 This past Saturday and Sunday Diana led nine students through this labor-intensive and difficult process. 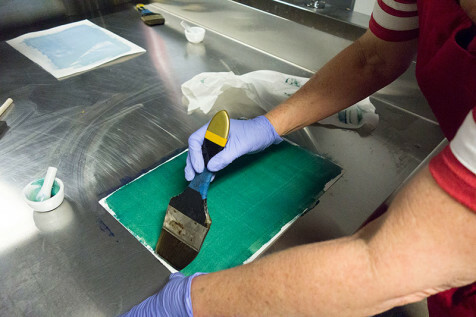 The workshop included many first-time gum printers, and despite the tricky nature of the process, all produced fantastic prints! 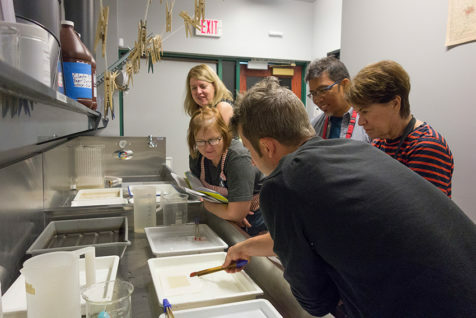 As we gathered around to look at everyone’s completed work at the end of the two days, one thing was apparent: there is nothing like the magic of gum printing, and no one better to teach it than Diana Bloomfield! 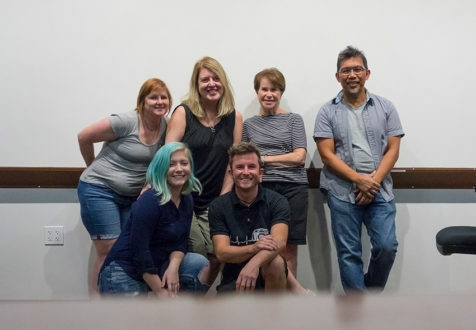 We are grateful for all of our students, but we especially would like to extend a big THANK YOU to our four class participants who travelled from far, far away to take this workshop with us – Cary from Alaska, Timothy from Michigan, and Scott and Kelly from Pennsylvania. We’re so glad you could join us! 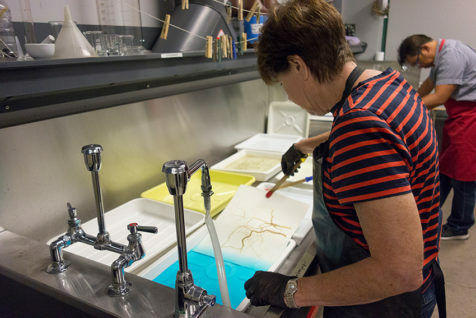 Karen coats her paper with a mixture of watercolor pigment suspended in potassium dichromate and gum arabic. 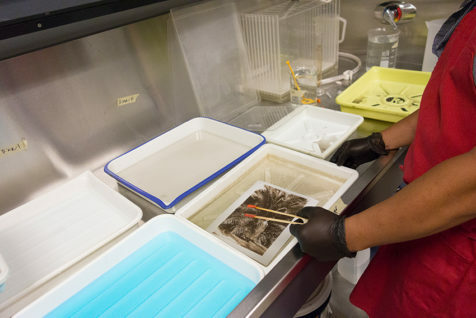 The potassium dichromate hardens the gum arabic upon exposure to UV light; the parts of the coating blocked by the negative remain soft and wash away in water.